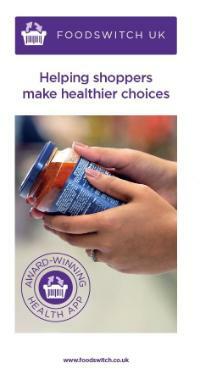 Our ‘FoodSwitch’ leaflet explaining our free smart phone app that helps you make healthier choices. Do you know how much sugar you should be consuming? Print off copies of our factsheet for your stand. Collect packaging for different foods and drinks (cereals, fizzy drinks, biscuits, ready meals etc); ask people to guess which contain more sugar; use FoodSwitch to help you. Use sugar cubes to show how much sugar is hidden in foods and drink (1 cube=4g of sugar). Look online for coffee shop nutrition information and test your colleagues to see how much sugar is in their favourite takeaway coffee. Use our guide to help you have a low-sugar bake sale. Recipe ideas available from Change4Life and BBC.